The Cowichan Merchants Building is a landmark structure with frontage on Station Street, Craig Street and Government Street in downtown Duncan. The Cowichan Merchants Building was built in 1912 to replace an earlier structure, built in 1910, which burned down in a major downtown fire on 25 September 1911. The original design for this building was by Victoria architect Alexander Maxwell Muir. 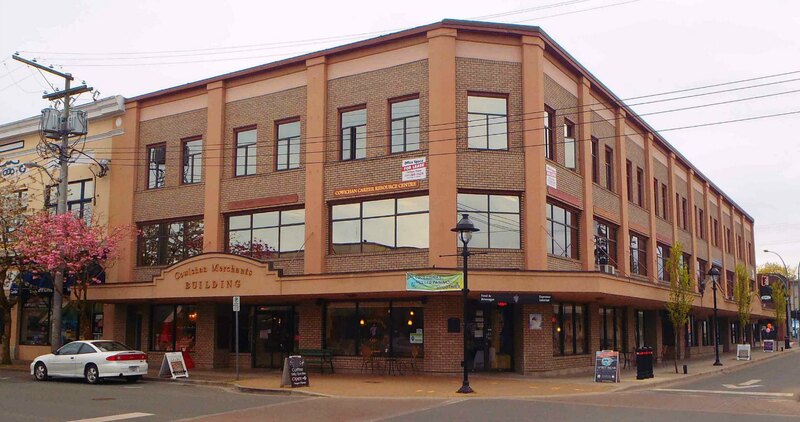 The Cowichan Merchants Building was designed as a department store and was used for that purpose until 1995, after which it was renovated into its current configuration as offices on the second and third floors with stores on the main floor. The Cowichan Merchants Building has undergone several exterior renovations over the years. In the 1950s, the T. Eaton Company completed a very unsympathetic exterior renovation by covering the entire exterior in stucco and concrete and reducing the size of the exterior windows. Following the T. Eaton Company’s bankruptcy in the late 1990’s, the building was renovated to its current appearance, which is based on the building’s original 1912 exterior design. Cowichan Merchants Building as an Eatons department store, circa 1983. Here is some historical background to the Cowichan Merchants Building taken from various sources. Source material is in quotes. Cowichan Merchants Ltd. was a partnership formed in 1910 between Duncan business leaders Thomas Pitt, Andrew Hans Peterson and William Penn Jaynes. Prior to this 1910 partnership, Thomas Pitt and Andrew H. Peterson had been operating a general store under the name Pitt & Peterson across the street in the Duncan Emporium building (demolished in 2015). The new Cowichan Merchants became the largest department store on Vancouver island north of Victoria. This morning [8 December 1910] at 9:30 when the doors of the new home of Cowichan Merchants, Ltd. are thrown open to the public, one of the finest buildings of its kind west of Winnipeg will be in use as a general store. The original Cowichan Merchants Building was destroyed, along with several other buildings, by a major downtown fire on 25 September 1911. The present Cowichan Merchants Building was built in 1912 to replace the original 1910 building. The work of preparation for the Cowichan Merchants, Ltd., on the site of their old building is being pushed forward with all possible speed. The building is to be considerably larger than the former structure. The full length will be 190 feet by a width of 60 feet. The front will face on Station Street and the rear will face on Government Street. The basement will be extended under the new addition. There will be two entrances on Craig Street and one on Station Street and the height will be the same as in the former structure. The space occupied by the old store will be divided into four departments. The Grocery Department and shipping room will be located in the rear portion of the building, and a gallery will be built round the interior within the former building. The building will be faced with white silica brick. Mr. Pitt started business in partnership with Mr. Peterson, trading under both names in the building at the corner of Craig and Station Streets, Duncan. It boards still show the old sign under certain weather conditions. In 1947, Cowichan Merchants Ltd. was purchased by David Spencer Ltd., which was a leading B.C. department store chain at the time. In December 1948, the T. Eaton Company, a national department store chain with headquarters in Toronto, purchased David Spencer Ltd. and converted the Cowichan Merchants Building into an Eatons department store. With a complete new face, new canopies, and extensive alterations to windows and entrance doors, the former “merchants” building will present an entirely new and up-to-date appearance outside…. Change in the appearance of the exterior face of the building will be effected by the application of sand-finish stucco. Second and third floor windows are to be of fluted glass. 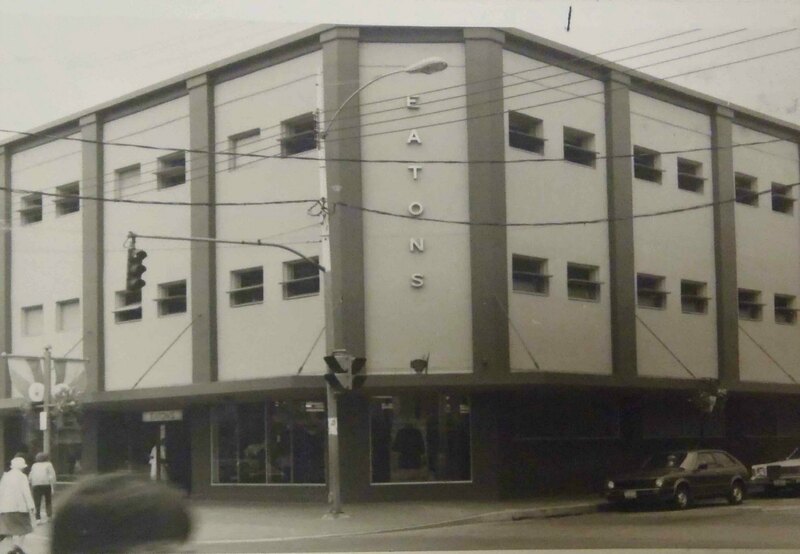 Looking at the above photo of the Cowichan Merchants Building as an Eatons department store, circa 1983, we can’t help thinking the building looks like a bunker. Eatons ran into financial difficulties in the 1990’s which ultimately led to Eatons declaring bankruptcy. After Eatons closed its Duncan operations in 1995, the Cowichan Merchants Building was renovated into its current use as offices and shops. Among other things, these renovations removed the bunker-like appearance Eatons had imposed on the building in its 1949 renovation. After Eatons closed its Duncan operations in 1995, the Cowichan Merchants Building was renovated into its current use as an office building with stores on the street level. The very dated, bunker-like, exterior which Eatons had placed on the building in 1949-50 was removed and the exterior was changed to its current appearance, which is more in keeping with Alexander Maxwell Muir’s original 1910 design.